Making sure your 3M High Airflow Filter (HAF) is clean, and replacing it when it becomes dirty, is one of the preventive maintenance tasks you can do to make sure your dehumidifier performs at its optimum level. These filters fit both the Dri-Eaz LGR 2800i and the Dri-Eaz dehumidification machine, which are both built on the same chassis, but provide different water recovery levels. Regular cleaning and replacing your filter will not only lengthen the life of your dehumidifier, but it will also protect the internal components from over heating and other problems. If filter is found to be dirty, blow out with an air gun, or use a vacuum to remove all dust and debris. Replace filter after blowing/vacuuming it out 3 different times, or immediately following a job involving the presence of mold. Do not wash the filter! Each filter is 0.8" x 16.5" x 15". 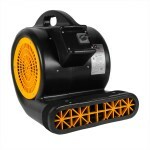 For more filter options, you can return to the dehumidifier accessories category. This is a review for the 3M High Air Flow Dehumidifier Filter (pack of 24).